Sustainability | River Action, Inc.
A sustainable future for our children is possible through awareness, education and stewardship of the Mississippi River and our shared RiverWay environment. 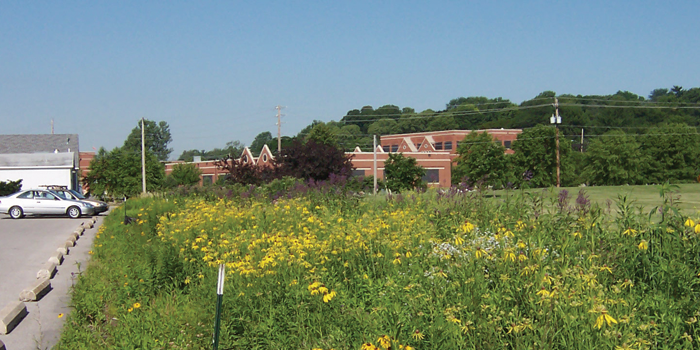 We recognize the importance of keeping our river healthy through green infrastructure, restoration, and supporting sustainable agricultural practices. What we do on our farms, front yards, and city streets ultimately impacts the health of our river. 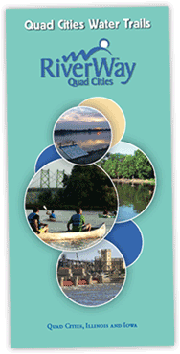 We advocate for the maintenance of healthy waterways through best management practices. 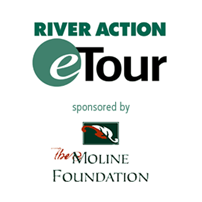 River Action has been a leader in the Quad Cities in educating and developing projects that reduce nutrient pollution and stormwater runoff to the Mississippi River and its tributaries. Click each tab below to read what we've been up to since 2000. Every gallon of rainwater collected keeps it out of our already swollen rivers and streams, and potentially out of your basement or business. Every gallon counts! 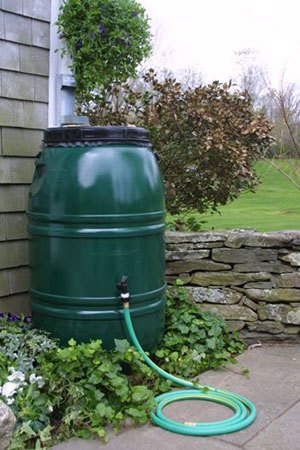 Rain barrels include a 60-gallon recycled food-grade barrel, lid, mosquito netting, downspout diverter, spigot, and two overflow attachments. WHY? 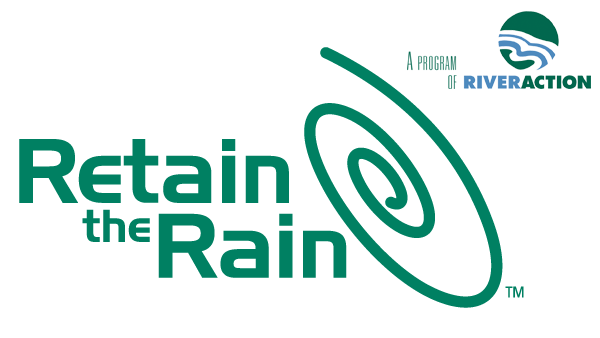 - Rain barrels are part of River Action's Retain the Rain program, an initiative to conserve water and lower flood levels in local rivers and streams. Using a rain barrel is one of the simplest actions you can take to reduce runoff by collecting the rain that runs off your home. Collected rainwater can be used to irrigate lawns, water landscape beds or wash cars. Rain barrels also reduce storm water runoff lessening the impact on storm sewers, local streams, and rivers. WHERE? - Barrels can be picked up at our Davenport office: 822 E River Drive (Please note we can not ship rain barrels). HOW? - The diverter channels water into the barrel when needed, and fits all downspouts, metal or plastic. The barrels are 0.1875 inch thick recycled polyethylene and can be joined together with a garden hose. When the barrel is full, the diverter can be flipped up to a closed position to let the downspout function normally. Buy a rain barrel now for just $75 (standard diverter) or $80 (large diverter) online, then pick it up at the River Action office! If you have questions call (563) 322-2969. Pre-order a rain barrel with a standard diverter (2" x 3")..
Pre-order a rain barrel with a large diverter (3" x 4").. 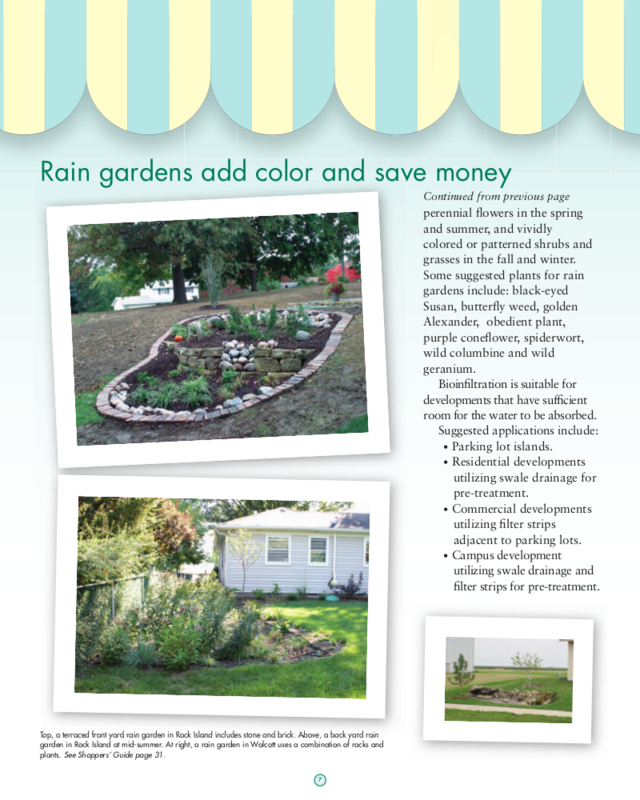 Retain the Rain is an effort to raise awareness about storm water runoff and its damaging effects, and provide residents with ways to reduce storm water runoff from their property. Those property owners adjacent to wetlands, streams, lakes and rivers play a key role in the effort to manage storm water runoff. 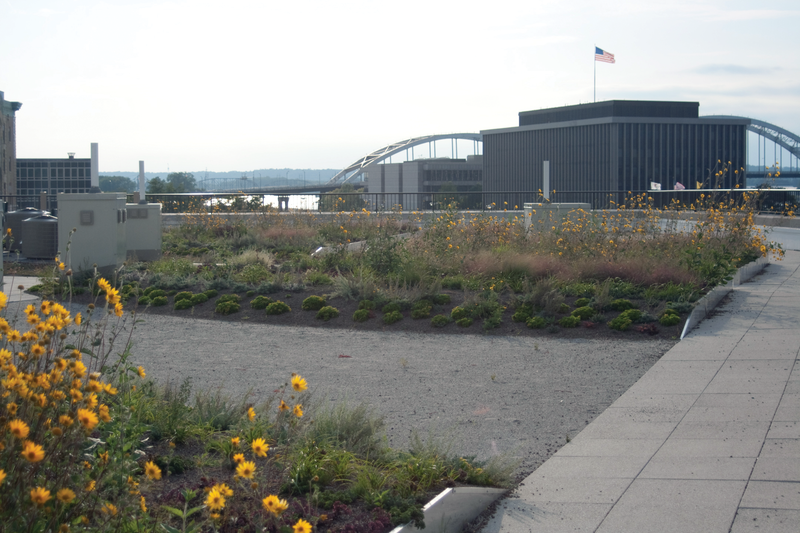 River Action has spearheaded 14 demonstration projects throughout the Quad City area including green roof, raingarden, bioswale, and porous pavement development through our Retain the Rain Program. 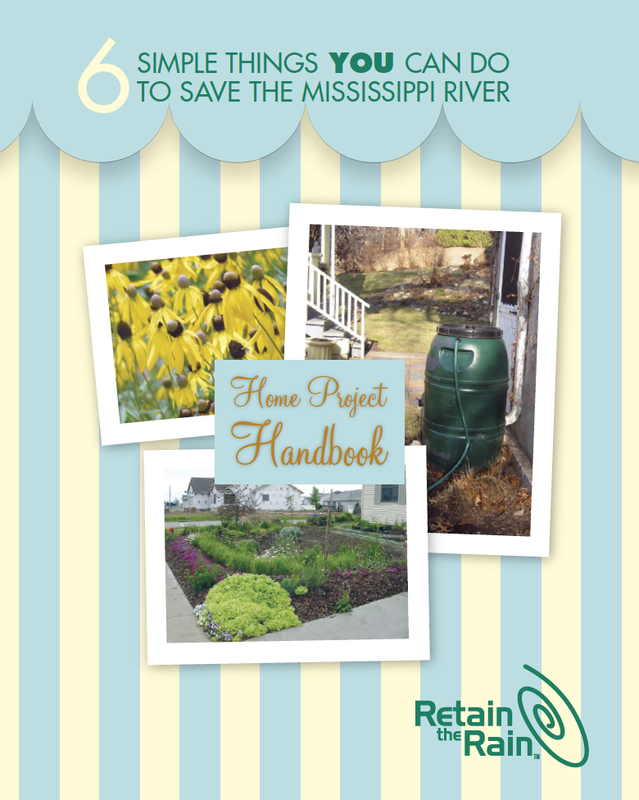 Through this program, River Action has distributed over 4,000 rain barrels in the Quad City region since 2002, and has developed an education kiosk and a home project handbook, “6 Simple Things You Can Do to Save the Mississippi River,” now in its second printing. The next time it rains, observe where the water runs off your property. Does the water coming out your downspouts, rooftop, sidewalk or yard soak into the ground quickly? Or, does it flow off the lawn, yard and driveway into the gutter and storm sewer drain? Are locations where runoff is occurring possible sources of contamination from oil, grease, pesticides or herbicides? Is erosion of soil apparent? Here are common sources of storm water pollutants: Silt, sand and clay particles from erosion and washing of car/trucks on driveway or parking lots; nutrients from over-use or spilled fertilizer, pet manure, grass clippings and leaves left on street; Metals from galvanized metal gutters or brake wear from cars/trucks; pesticides from over-use, spilled or leaks; hydrocarbons from oil and gas spills, burning of leaves or garbage and car/truck exhaust; disease organisms from pet manure or garbage. A bioswale installed to capture runoff from the parking lot at the Lindsay Park Boat Club. Once you've assessed your property, consider ways to control/manage your storm water runoff, including planting grass or ground cover to stop erosion of soil. Native grasses with their highly developed root systems are ideal. If the erosion is particularly acute, landscaping alterations may be needed. For hilly lots, slopes can be terraced to slow the runoff and make maintenance easier. During construction of a home or business, silt fences can help slow runoff and keep sediment on-site. When possible, use a porous pavement surface such as interlocking cement blocks which have spaces that allow rainwater to seek into the ground. When using asphalt or concrete, keep the paved area as narrow/short as possible. Your roof, like your driveway, sheds water into grassy areas. Use gravel to prevent soil erosion around your house and increase the ground's capacity to absorb the water. 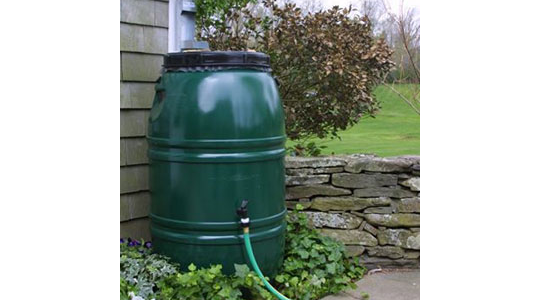 Consider using a barrel to catch rainwater for use later to water plants/lawns. Consider naturalizing part of your yard to contain runoff. If you live near a creek, stream or lake, maintain a buffer strip of native grasses or flowers to slow runoff and filter pesticides/herbicides. Do not dump grass clippings, brush or leaves onto the stream or creek or burn yard waste near the stream bank. To prevent pollution of streams/rivers: Always follow the usage rules when applying pesticides; do not fertilize or apply pesticides near a creek or stream bank; limit your use of de-icing salt in the winter; when mixing/filling fertilize or pesticide applications, avoid using hard surface areas, where chemicals can run off easily; do not dispose of oil, or excess fertilizer/pesticides in storm drains; if you wash your car at home, use small amounts of low-phosphorus detergent and wash the suds into the grass, not down the driveway; maintain septic systems by having them inspected every two to three years. Six Simple Things. . .
Click on above image to download the 32-page booklet. With storm water runoff fees and increased concern about contamination of water supplies and flooding, it makes sense to seek ways to reduce rainfall runoff from residential lots through the use of native plantings and simple retention projects. This handbook outlines the most common retention projects to retain water on your property, allowing it to soak into the ground rather than flow into storm sewers. Most of the projects make use of native plantings because of their ability to soak up water and stabilize the soil. Native plantings are adapted well to the local environment, providing color to yards from May through October and refuge for birds, butterflies and other insects. They're also more tolerant during periods of drought. This booklet gives you detailed plans and specifications for building the retention projects, along with estimated costs for the improvements. The projects range from simple actions, such as installing a rain barrel to capture water from your roof, to more complex jobs, such as installing a green roof. All have been or are planned for the Quad Cities area. You'll also find a Resource List of suppliers, landscapers, contractors, architects, and sources of other products and services you need in order to install the retention projects. The Shoppers Guide provides specific information about the projects featured in the photographs throughout this handbook. Working together, one home or business at a time, we can help reduce storm water runoff in our community and improve the water quality of our streams, lakes and rivers—most notably, the Mississippi River. CLICK HERE or on the image above to download the 32-page booklet. The green roof installed atop the McKesson Building in Rock Island. 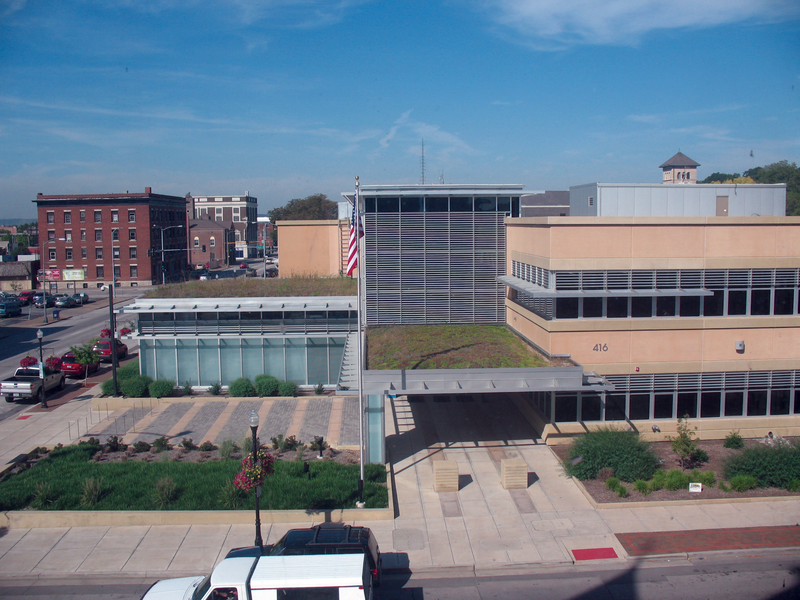 The green roof installed atop the new Davenport Police Department building.